We’d love your help. Let us know what’s wrong with this preview of Crybaby by Karen Beaumont. To ask other readers questions about Crybaby, please sign up. On a quiet street in a quiet house the silence is broken by a baby's cry. Her wail wakes Roy, the old retriever, and he alerts the family. The baby wakes everyone in the house, and the neighbors next door. They all try and quiet the baby but nothing works. Roy knows what needs to be done, and after several times of ignoring him, the humans finally take heed, and thanks to Roy the crybaby no longer cries, and falls right to sleep. Another wonderful story by Karen Beaumont. The baby cries and wakes everybody in the house, and the neighbours too. Everyone tries, but they can't make the baby stop crying. No one will realize the dog, Roy, understand the problem better than they do. Fun illustrations for this cleverly rhymed story. Such a cute story about the special bond between a dog and a baby. If you are a dog lover, this just makes you smile! I'm sure a child between 3 to 5 years old would find this repetition and rhyme fun to read. DS is 4 and he loved it! Very, very sweet book. The baby wakes up and cries and cries. Nobody can console her. The dog wants to, but is not allowed to. The baby cries and wakes up everyone in the house and the neighbors too. Roy the dog knows the baby just wants his toy. Finally, he's able to give the baby the toy and she falls fast asleep. Fun and cute and fun colorful artwork! This book is about a baby crying and the dog being the only one who knows what the baby wants. The book is a good book for repetition. Cute Rhyming text about a baby crying and everyone trying to comfort the baby! The Smart Dog is the hero he gives the baby the wooly sheep its longing for to calm it down! There is an error in the final illustration of the dog sleeping on his dog bed, with a FULL bowl of dog food right under his nose. That bowl should be empty! What dog leaves a full bowl of food right under his nose, sleeping or not? None that I know of. Baby wakes up everyone when she cries. Everyone tries to get baby to stop crying and go to sleep. Only Roy the dog knows that she wants her toy. When she finally gets it she goes right to sleep. This was a cute book. It kind of reminded me of the napping house. Each person that tries to get baby to sleep builds on the last person's attempt. I love that the dog knew all along what the baby needed to be happy. I think kids with a new baby sibling would really relate to this. It might be good to read Baby wakes up everyone when she cries. Everyone tries to get baby to stop crying and go to sleep. Only Roy the dog knows that she wants her toy. When she finally gets it she goes right to sleep. Summary:This book is about a baby girl, name not given, who lives in a very quiet house. One night she broke the silence with many tears. She woke up everyone in the house, including her dog, named Roy. The story line goes with one person waking up to the babies cry and trying to guess whats wrong with her, which doesn't help. So another person wakes up and tries to help, which doesn't work either. The story continues with the baby waking up her dog, parents, siblings, grandparents, and even nei Summary:This book is about a baby girl, name not given, who lives in a very quiet house. One night she broke the silence with many tears. She woke up everyone in the house, including her dog, named Roy. The story line goes with one person waking up to the babies cry and trying to guess whats wrong with her, which doesn't help. So another person wakes up and tries to help, which doesn't work either. The story continues with the baby waking up her dog, parents, siblings, grandparents, and even neighbors. While each person is trying to help the baby, Roy is nearby with a stuffed animal trying to get closer to the baby. Every time this happens, the parents yell out to Roy saying no no. So what makes the baby stop crying after all? Activity: Bloom Four, Analyzing; What motive is making the baby cry? This activity would be happening as I read the book. Before I read the book, I would ask the students why they thing the baby is crying. We would make a list of either words or pictures on a white board. As their ideas showed up throughout the book we would eliminate it off the board. The book goes through many typical reasons a baby would cry, which the students would probably guess as reasons too. Once one guess is eliminated I would tell them to think of different reason to add to the list, until they finally think that it's that the baby wants the stuffed animal. After the book is read, we would have pair and share. We would each talk about what we like to fall asleep with. I would first start by telling them I use to fall asleep with a scooby doo stuffed animal and an elmo blanket. This book focus is on a baby crying and the reaction of people around the baby. The book encourages readers to have fun with reading aloud especially saying, "Burp, burp! Slurp, slurp! P-e-e-u-u-w-w!" Children will want to read this book again and again especially if they have a new baby or a dog in their home. The illustrations are amazing; especially the facial expressions of the dog. Geared for PreK-first grade this book would be an excellent read aloud when teaching onomatopoeia to upper pri This book focus is on a baby crying and the reaction of people around the baby. The book encourages readers to have fun with reading aloud especially saying, "Burp, burp! Slurp, slurp! P-e-e-u-u-w-w!" Children will want to read this book again and again especially if they have a new baby or a dog in their home. The illustrations are amazing; especially the facial expressions of the dog. Geared for PreK-first grade this book would be an excellent read aloud when teaching onomatopoeia to upper primary classrooms. This book is full of hula hooping, magic tricks, juggling, soap bubbles, and music! No one pays attention to the dog even though he knows why the baby is crying. The babies' family and neighbors try everything in trying to her stop. Tears of joy will be shed reading this charming book. Whitehurst, L. (2015, May 1). 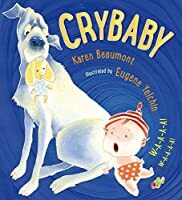 [Review of the book Crybaby, by K. Beaumont]. School Library Journal, 61(5), 78. Retrieved from NoveList Plus database. A very expressive dog and strong catchphrases make this book an excellent read-aloud. “The more they tried, the more that baby cried” is heard throughout as everyone attempts to calm the child. McDermott comments on the illustrators use of watercolor, cut-paper illustrations. Eh. I may have just had too-high of hopes for this book, being a big-dog owner waiting on their first child. But this was just...pretty boring. The idea of a family being unable to understand why a child is crying, while the dog is completely aware, seems cute enough. But the text just didn't seem to flow all that well. I was more impratient for them to pay attention to the dog than amused at the misunderstanding. Perhaps others will enjoy this more, but I do see that the Goodreads reviews are av Eh. I may have just had too-high of hopes for this book, being a big-dog owner waiting on their first child. But this was just...pretty boring. The idea of a family being unable to understand why a child is crying, while the dog is completely aware, seems cute enough. But the text just didn't seem to flow all that well. I was more impratient for them to pay attention to the dog than amused at the misunderstanding. Perhaps others will enjoy this more, but I do see that the Goodreads reviews are averaging about 3-stars, as well. Which means a significant number of people liked this even less. This may be one of those titles that I like better once I've done it as a read-aloud in ST. It has repetitive noises that the children should like and I think they will enjoy the fact that it is the family dog that knows what baby needs to go back to sleep. A cumulative story in which the baby is crying and everyone is trying something different to calm the baby back to sleep. From the beginning, the family pet dog has it figured out, but everyone still insists on their own fixes before admitting defeat. Vibrant artwork incorporates humor. Great read aloud for PreK-2. When baby cries WAAA WAAA, she wakes up the dog BARK BARK! Baby cries and wakes up mother, father, sister, brother, grandma, grandpa, and even the neighbors. No one knows how to get baby to stop crying… except the dog. Good boy! Now everyone can go back to sleep. Beaumont uses repetition and rhyme to create a solid story built around the family antics that occur when a baby wakes up crying. Luckily, the family dog knows what to do, though it takes the family running through all of their ideas before they listen to the long-suffering hound. This has the potential to work well with large groups for storytelling or one-on-one. Highly recommended. I love Karen Beaumont. I wasn't sure about this one after the first read through but both my kids like it a lot. 4yo says "Waaa" every time and was saying, "No Roy, Down Boy, Baby doesn't want that toy" at dinner tonight. Another keeper. Very annoying that nobody gave the baby her toy until even the freaking neighbors couldn't make her stop crying. The chorus could make a fun storytime readaloud, but I think for younger than my students are. What fun! It's full of rhymes and repetition, and would make a great addition to our "Pajama storytimes!" Picture-book authors are pretty obsessed with puppies, but this book has the cutest, derpiest, sweetest old dog. He's the only one who knows how to calm down the crying baby in the middle of the night. Really cute. It does takes a family and neighborhood to calm the crying baby, but it is Roy the retriever who knows what to do. The expression on Roy steal every scene. My daughter (age 3) LOOOOOOVED this book. We read it many, many times. It is a fun, repetitive book. Fun read aloud. Love the illustrations. Cute little lullaby of a story. Very enjoyable. Awesome rhythm! Will be great for sharing in storytime. Lovely cumulative book with a lovey text that progresses nicely to the solution. Crybaby has a lot of repetition which will make it a good storytime read. I enjoyed the fact that the family dog knows best. Karen Beaumont is the New York Times bestselling author of many award-winning picture books. She lives in Scotts Valley, California.